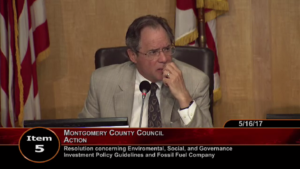 The Montgomery County Council passed a resolution Tuesday urging the boards managing county employee pension plans to minimize investments in companies with the largest fossil fuel reserves. The vote was 8-1, with Councilmember Nancy Floreen the only nay vote. The resolution has no binding effect. 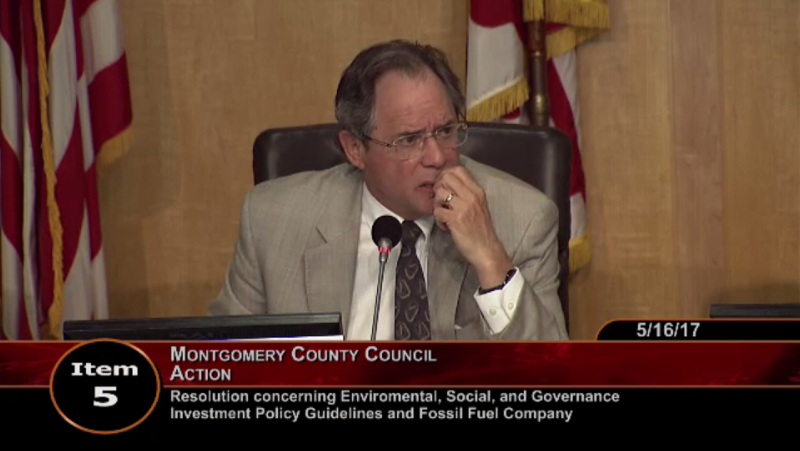 Council President Roger Berliner sought the measure to encourage the pension plans’ oversight boards with a mechanism to divest from fossil fuel companies “whose work threatens our planet” while they also meet their fiduciary responsibilities. The matter sparked testy remarks from Councilmember George Leventhal, who objected to a last-minute change to the resolution — the addition of a reference to the Carbon Underground 200. According to its website, the Carbon Underground 200 is a list of the 100 largest public oil and gas, and the 100 largest public coal companies. Berliner said he did not believe the addition was controversial. 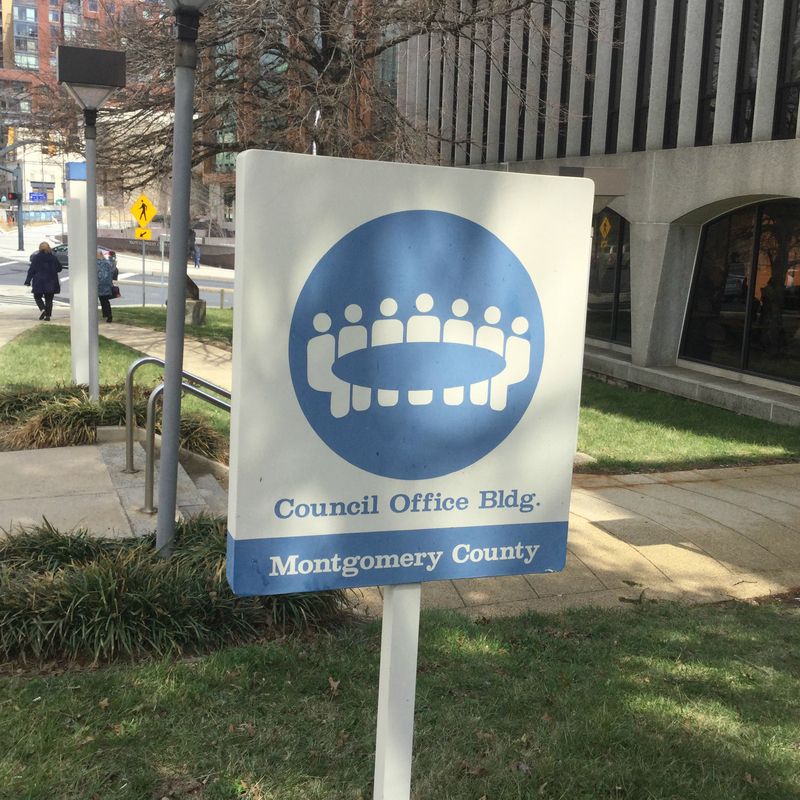 Leventhal said he believed council members could have used some time to digest the change. “I understand the council president is in a big hurry,” Leventhal said. Berliner introduced the measure in October. 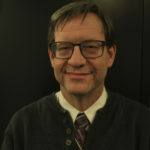 Originally written as legislation, which would have had the force of law, the Board of Investment Trustees of the Employees’ Retirement System and the Board of Trustees of the Consolidated Retiree Health Benefits Trust objected to the council interfering with how they manage their funds, according to an April letter from Berliner to his colleagues. As a result, the legislation was converted into a non-binding resolution. On Wednesday, Floreen noted that the council already had passed a utility budget that called for spending $120 million on fossil fuels, not to mention products that come from petroleum, such as asphalt and plastic. She noted that the resolution’s lack of a binding effect. Floreen said national politics helped drive the local resolution. “I think under the current political situation, folks at the local level feel compelled to make a statement to reassure the political base that they’re still with them, because it doesn’t seem that way at the national level,” she said.